We love to chat. It makes the communication faster and more convenient, especially if you need something on the go. But chat discussions are like wild hounds, once you let them go, there is no catching up. They quickly become disorganized and messy. We experienced this ourselves with the old way Discussions worked in Swipes. Therefore, we looked for a better way of organizing the team communication. A team needs a space which allows everyone to work at their own pace while still having the context of the conversation. The new Discussions do exactly that. 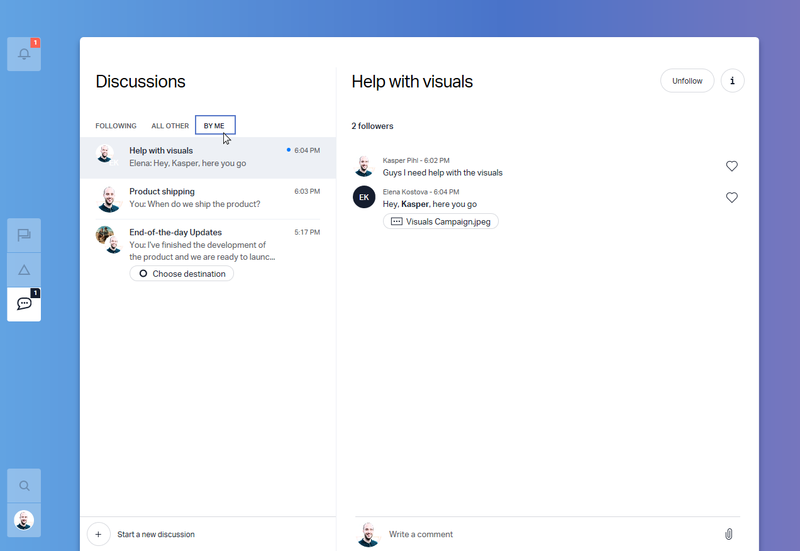 They allow you to create an email-like thread with a topic and shared files, but comments can be quickly added and dicussions can be fired up like in a chat. With the new Discussions you can still have casual chats with your teammates, but now you can also create groups around a topic. You do that by starting a discussion, setting a topic for it (think of it as the email subject line), and tagging the relevant people. Then the group will appear on your Discussions page. This way, each division of your team can have an organized space to share knowledge, discuss strategies, and make decisions. All files, notes and links can be shared there. Browsing through the different topics makes it very easy to catch up on projects. The conversations that you are part of are displayed in the "Following" section. These are the discussions which you need for your work and that are relevant to you. Occasionally you`d want to keep track of what is happening with the rest of the team responsibilities and see if there are things that you can help with. You can find all those discussions in the "All others" section. You can sort out which conversations are important to you and are worth following along by clicking the "Follow" button. Then those topics will appear in the Following section. You can also tune out of a conversation once it’s no longer relevant to you by simply clicking "Unfollow". This will move the topic into All others section. Related Discussions – The new Discussions create a centralized system where related conversations and file transfers are kept in a single project-related group. This new way of dealing with information makes the related discussions redundant therefore we removed the feature from the product. 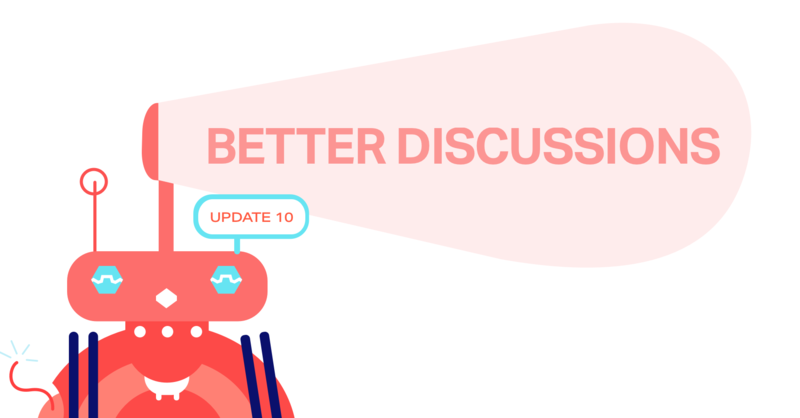 Notifications about Discussions – we decided to move the notifications about the communication into the discussion section. We left the notification section for the important things such as mentions and goal assignments. Comments and reactions will be visible directly in the discussion section. Say no to spamming notifications from long chat threads and start using your time wisely. Allow people to join & tune out of conversations based on their relevance at the moment. The new feature benefits from the best of both worlds – it has the functionality and stability of an email but also the speed and comfort of a chat. This allows you to do the things at your pace, follow your own schedule and easily come back to the topics when you need them. How do you like this new update? Is there something you would like to see improved? Are there any features you miss? Drop your feedback in the comment section below.